Here it is – the great reveal! Do you think this painting reasonably matches the description provided by our two eye-witness relatives? (see part one) And they both said it was a study in brown, although neither said that was its actual title. Call it wishful thinking if you like, but JA and I were both drawn to this painting. We considered it a strong possibility that we were looking at our ancestor, Lucy Elizabeth Creft. Our next step was to prove it. Relying on their collection database, the librarian at the NSW Art Gallery advised the gallery had only ever owned one portrait named Study in Brown, but that the sitter was unknown. This very co-operative librarian had also checked all the correspondence between Norman Carter and the NSW Art Gallery, but there was no mention of the sitter in any of his letters. Our first port of call on our “proof of life” was to the NSW Art Gallery library which holds the catalogues of many gallery exhibitions, indexed by artist but not by title. We went through pamphlet after pamphlet. Norman Carter entered portraits and paintings in annual exhibitions organised by the Royal Art Society of NSW, the Society of Artists, and many others over a career which spans fifty years. In 1959, a retrospective exhibition of Norman Carter’s paintings called “A Lifetime of Paintings” was held in Sydney. The forward in the catalogue was written Lloyd Rees. “Study in Brown” was not part of that display as far as we could discover. It was a work from early in his career, exhibited at the “Twenty-ninth Annual Exhibition of the Royal Art Society of New South Wales (1908)” and purchased by the NSW Art Gallery in August of that year. 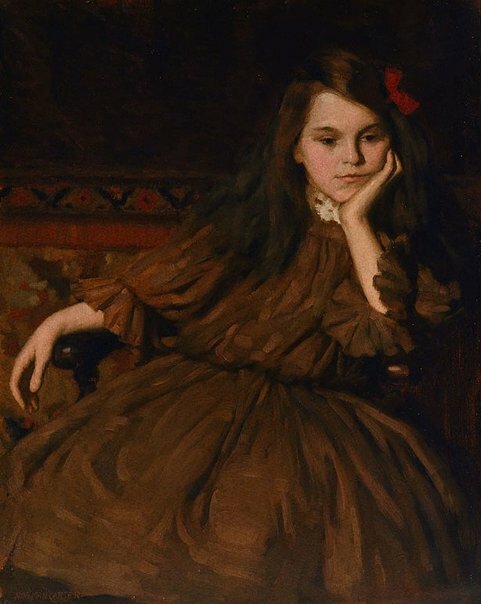 In fact, “Study in Brown” was so early in his career, that in his letter of 20 December 1911, Norman Carter offered to exchange it for “A low toned harmony” as he believed that “Study in Brown” was not the best example of his portraiture. The gallery declined. “A low toned harmony”, went on to win a bronze medal in the Paris Salon in 1913, and was exhibited at London’s Royal Academy in 1914. Turns out it is a depiction of Florence Rodway, who we had already encountered in Part 2. It is now owned by the State library of NSW, and comes with an intriguing mystery. See the painting and history here. There was a point in time when the NSW Art Gallery was called “The National Art Gallery of New South Wales”. In 1938 they mounted an exhibition called “150 years of Australian art (1938)”, which included “Study in Brown”. Later, and I guess on loan, the portrait was also displayed at a Society of Artists Exhibition in 1958. So you can see we were building a good picture of Norman Carter, the artist, and we were getting tantalising glimpses of “Study in Brown”, but were no closer to having the sitter named. JA’s grandmother remembered that the portrait used to hang very near an imposing military painting. My aunt told me it hung in a hall on the right as you enter the art gallery. Today, this area is called the Grand Courts, and is a series of open spaces connected by open curved archways. At the end of the archways, clearly visible as you enter the first, is a huge painting depicting the “Charge of the 4th Hussars at the battle of Friedland, 14 June 1807”. We tried and tried to find any record of where “Study in Brown” was hung* because if we could just prove that it was right beside a military picture, we had one more piece in our armory (pun intended). But there was nothing in the records that said where our painting had resided in its many years on display. The only thing we could establish was that the gallery was re-arranged in the early 1940s, and that is probably when our painting went into storage. No doubt the art gallery holds many more clues, but as amateur sleuths, we felt we’d come to the end of that road. There. But a short walk away lies the NSW State Library, repository of thousands of pieces of Australian history. First we needed to fortify ourselves with lunch and coffee, which we did in the grounds of another historic icon – built around 1815 and originally known as the Rum Hospital – read more about the Sydney Hospital here. What did we find in the State Library’s archives? And on that note, my friends, I will leave you hanging for today . . . Sorry I haven’t commented for a while. I really love the painting, but I am most impressed by the detective work. Thank you. I seem to have developed an obsession with research in my later years. There are worse vices, I suppose. I was dead lucky coming in late and getting 1,2 & 3 all in one hit. You will be in dire straights if you finish up saying that the portrait in 3 is not Lucy. Isn’t she gorgeous? And I can disclose we never wavered in our conviction that it was Lucy. . . But could we prove it? That remains the question . . . I think it’s Lucy pulling my strings . . . Trying to keep up with these Gwen but have been Berlin challenged :(… The photo is gorgeous and will read your narrative when in one position for a few minutes! I do hope you get to read them eventually, but I so understand how difficult that is when you are not “at home”. Yes, it’s growing by itself. I had originally imagined a much more academic writing, then I realised it was too detailed to hit people up with in one go. I miss my Aunty Myra. She passed a few years ago aged 95. Unfortunately she lost her memory, but never her sweet nature.